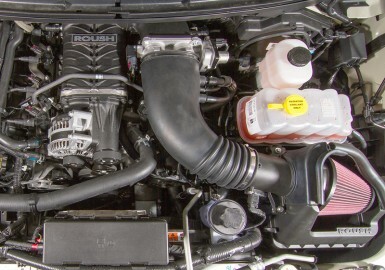 Increases power level from 515HP/460 lb-ft. to 570HP/530 lb-ft.
Are you having fun with your 2011-2012 ROUSH Phase 1-equipped 5.0L V8 F-150, but want more power? 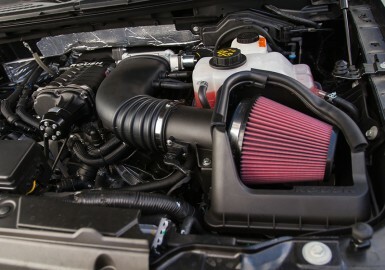 The 5.0L F-150 Phase 1-2 Supercharger Upgrade Kit includes all of the necessary components to increase your ROUSH Phase 1 Supercharger from 515HP/460 lb-ft. to 570HP/530 lb-ft! This part now utilizes the ROUSH Flash Voucher card to be used with the ROUSH Diagnostic Tool (RDT) software and pass-thru device. If you do not have access to an approved pass-thru device, you can send your PCM back to ROUSH to be flashed for an additional $100.00 fee. This kit is protected by a 3 Year/36,000 Mile Limited Parts Warranty, which is valid for 3 years or 36,000 miles from the retail purchase date on ROUSH components only (not including labor). This upgrade kit will void the original Phase 1 ROUSH Drivetrain Warranty, if applicable.